BusyContacts syncs with several social networks — Facebook, Twitter and LinkedIn. You can connect to a social network by selecting BusyContacts > Preferences > Accounts, clicking the Plus (+) button, and choosing a social network (Facebook, Twitter or LinkedIn), and entering your username. BusyContacts syncs directly with Twitter, and indirectly with Facebook and LinkedIn through OS X Contacts. Therefore, in order to sync BusyContacts with Facebook or LinkedIn, you must also configure OS X Contacts to sync with Facebook or LinkedIn by selecting Apple () > System Preferences > Internet Accounts, clicking Facebook or LinkedIn and enabling Contacts syncing. Once you have Facebook and LinkedIn syncing configured in OS X Contacts, you should see the same Facebook and LinkedIn contacts in BusyContacts. 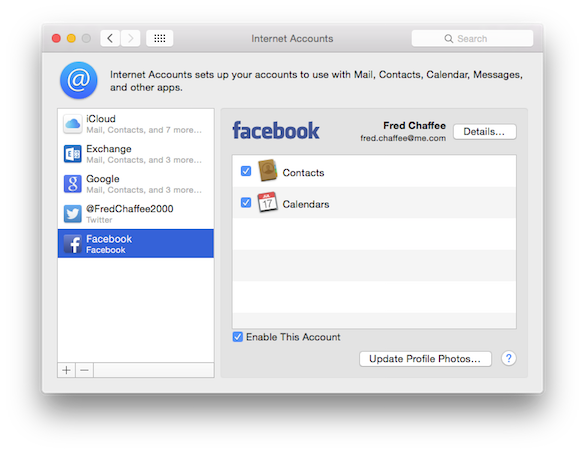 All your Facebook friends will not appear, however, because OS X Contacts only syncs Facebook contacts who have useful contact information like an email address or mailing address. 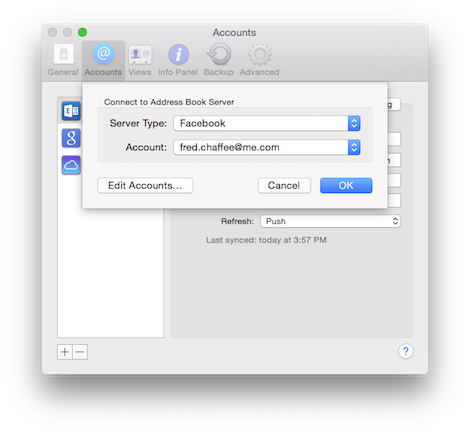 Note: Facebook and LinkedIn accounts will sync each time that OS X Contacts is launched. So, you'll need to periodically launch OS X Contacts to fetch changes from Facebook and LinkedIn. Facebook — name, photo, birthday, email, address, etc. Twitter — name, photo, URL, city, etc. LinkedIn — name, photo, city, company, URL. The social network address books are read-only, so you can view the contacts on social networks but you cannot edit them. Although you can't edit the contacts on social networks, you can link them with contacts on your writable address books. By doing so, you can associate the photos, birthdays and other data fetched from the social network cards with your writable address book cards. In addition to fetching photos and other contact info, BusyContacts will display recent tweets from your Twitter contacts in the Activity List.